The Wirral has been announced as the latest area to benefit from Openreach’s ‘Fibre First’ programme, where fibre optic cables are laid from the exchange right to people’s front doors. The UK’s largest telephone and broadband network is making new, more reliable, and more resilient Fibre-to-the-Premises (FTTP) technology available to tens of thousands of homes and businesses across the borough, with Wallasey being the first area to benefit. 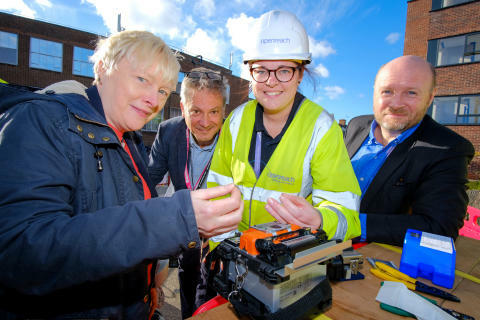 Liam Byrne MP, the Shadow Digital Minister, and Angela Eagle, MP for Wallasey, joined Openreach CEO Clive Selley at the Wallasey telephone exchange to join together the first piece of fibre cable as part of the rollout on the Wirral. They also met newly-recruited Openreach engineers, who demonstrated some of the latest state-of-the-art engineering kit including Openreach’s flexible fibrescope cameras, which inspect underground ducts for damage and blockages before work starts, so reducing the chances of having to dig up roads and pavements. The Wirral becomes the 10th area to benefit from the first phase of Openreach’s multi-million-pound fibre investment. This first phase will initially connect up to 40 UK towns, cities and boroughs and is part of a bigger plan to reach three million homes and businesses by the end of 2020. “Openreach is getting on with building the infrastructure Britain needs to stay ahead in the global digital economy, and families and businesses in the Wirral will be among the first to benefit from this commitment. It’s a further boost for the North-West, which in January heard it would benefit from Openreach’s unprecedented recruitment drive: more than 280 new trainee engineers will be employed across the region to help deliver ultrafast broadband. Across Liverpool and the Wirral, around 30 new positions have been created within the last 12 months, and their work is already making a significant contribution to making sure Britain’s workforce and businesses remain competitive for decades to come. Openreach has already made ultrafast broadband – using a mix of technologies - available to more than one and a half million premises across the UK, and has ambitions to go even further. The ambition is to build FTTP to around 10 million premises by the mid-2020s, and ultimately the majority of homes and businesses across Britain if there are the right conditions to invest.